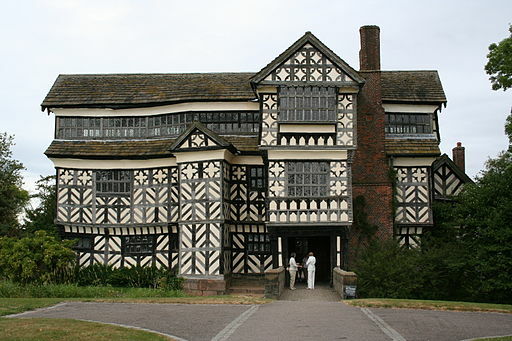 Tudor houses are famous for their black and white effect. Most ordinary houses had a black-painted timber frame with the spaces between filled with wattle-and-daub which was often painted over with limewash to make it look white. The timber beams would often look uneven because they were cut by hand rather than by machine. Roofs were steeply pitched and covered either with clay tiles or thatch. Windows were made by blowing bubbles of glass and cutting them up into diamond shapes. These were then fixed together with lead strips. Glass was expensive however, so poorer people had windows without glass, which were covered with shutters at night or when it was cold. The upper floors of some Tudor houses were bigger than the ground floor and would overhang (called a jetty). Interior walls were sometimes painted, and hung with portraits and tapestries. The floors would sometimes be covered with rushes (a type of grass). Although, this would be replenished, the bottom layer would remain for years and make rooms smelly.